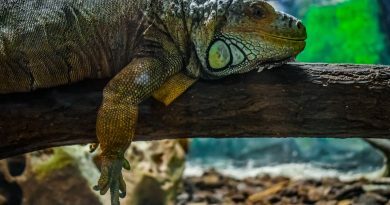 Some of the best cage furniture, especially for humidity-loving reptiles, are real plants. 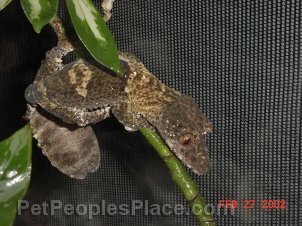 They help keep the humidity up, provide hiding and basking places, and look very nice. Make sure you choose a non-toxic plant. Remember that plant eating species will nibble on plants, so you may need to have several on hand to rotate out of the cage, so they don’t get killed by a hungry reptile. When you bring a plant home, you will need to re-pot it in plain top soil, with no additives like perlite or chemical fertilizer. Try to wash off as much of the old soil as possible. Also wash the leaves in soapy water to remove any pesticides used on the plant. If you can leave the plant out of the cage for a month or so, it will be even better. This will allow any chemicals the plant has absorbed to dissipate. In addition to plants, there are lots of other good things to use in cages. Driftwood, rocks, fake plants, plastic hide boxes, cork bark, PVC pipe and even flower pots are great. With some small PVC pipe and some fittings, you can make a great climbing structure for arboreal animals. Avoid anything made out of cedar, or any wood that has an odor. These can be toxic. If you get anything from outside, you will need to disinfect it to remove any bugs or germs. If it is small enough, you can bake it at a low temperature in your oven. Just keep an eye on any wood to make sure it does not scorch. Larger pieces can be soaked in bleach water, rinsed very thoroughly, and allowed to dry. You can be creative, and set up a very elaborate cage, or you can have a very simple set up. Keep in mind that the more elaborate, the more items you will have to clean. It will be more work, but many people find it is worth it.